What could be more beautiful than a palm tree in your garden? The garden immediately gets an exotic and exclusive look. Planting your palm in the open also has a number of advantages. In the end, it will grow faster and grow bigger, which will make it stand out better. It also will be more hardy. Also, a palm in the open requires less care. This article offers you a visual step-by-step plan for planting your palm in your garden in 6 steps. Of course, in our climate not all palms are suitable for planting in the garden. Therefore, look at the characteristics and especially the hardiness of the palm in advance to avoid disappointments. The Trachycarpus fortunei and Trachycarpus wagnerianus are the most popular for outdoor planting because they need hardly any protection during the winter months due to their winter hardness down to -18°C (-0,4°F). But of course there are many other species that are also suitable. The more effort you are willing to do, the more choice you will have. 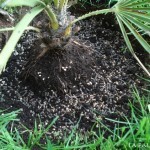 Take also a look at the article: How to protect your palm tree during winter. After choosing the species that best suits your needs, it is advisable to carefully select the place of planting. In this respect, take particular account of the factors that have a negative or positive influence on the hardiness. This will benefit the health and growth of the palm. For instance, a place in front of a south facing wall will easily warm up by several degrees compared to other places and it is best to avoid places where the soil stays too wet. Some shelter from wind will also provides a positive effect. Where perennials can be planted all year round, this is not recommended for palms. 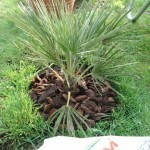 After planting, the palm needs some time to settle and it is therefore not advisable to plant just before winter. The most ideal is spring (April/May) when it no longer freezes at night. The palm thus has an entire season to adapt to its new spot. 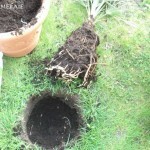 Dig a hole that is certainly larger than the root ball of the palm. Spread a layer of horticultural potting grit on the bottom for proper drainage and help to roots to settle. 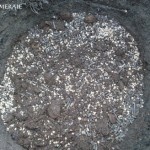 Partially fill the hole with good potting soil (use the composition that corresponds to the needs of your palm, a Trachycarpus for instance does not require any special soil). 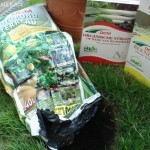 If necessary, mix a small handful of blood meal and bone meal granules in the soil for a healthy root growth. 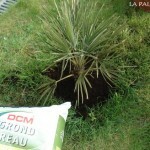 Place the palm in the planting hole. The base of the trunk must not be placed deeper than before! 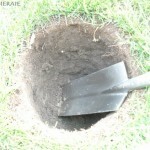 Fill the plant hole with potting soil and press the soil firmly. If desired, cover the soil with a covering material such as wood chips to prevent weed and moss growth, to prevent dehydration and for insulation, then provide sufficient water to allow the soil to set in nicely around all the roots. The first year it is not recommended to fertilize. The palm will generally not grow very much during this first year neither. It will put all its energy into the development of new roots. It is important to water regularly when it doesn’t rain for a while. As soon as the roots are formed, the palm will visible grow new leaves again. 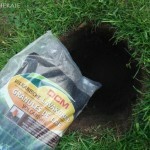 Now you can also fertilize with a organic fertilizer. 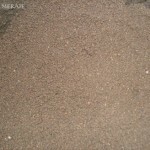 These grains are spread at the base of the palm. However, fertilisation is not always necessary depending on the type of soil in your garden. Every new year your palm will grow a bit faster than the year before. Palms planted at a smaller size, will settle easier than bigger palms and will therefor develop a higher growth rate.